Banteay Sam Re located at Preah Dak commune, Bon Tiey Srey District by Charles De Gaulle Road via Angkor Wat in 16-kilometre distance from the provincial town of Siem Reap. Banteay Sam Re is somewhat is located, and you should be vigilant of your possessions and travel with a local guide. The temple is worth the extra effort to experience the elaborate architecture, and fine carvings, although theft has mutilated many of the temple's treasures. 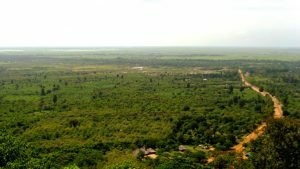 Location: 400 meters (1,312 miles) east of the East Baray Access: enter and leave Banteay Samre from the east. 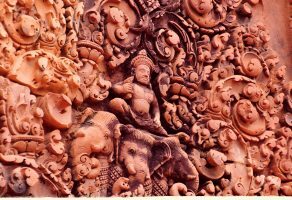 Date: middle of the 12th century King: Suryavarman II (reigned 1113-1150) Religion: Hindu (dedicated to Vishnu) Art Style: Angkor Wat BACKGROUND Banteay Samre is one of the most complete complexes at Angkor due to restoration using the method of anastylosis. Unfortunately, the absence of maintenance over the past 20 years is evident. 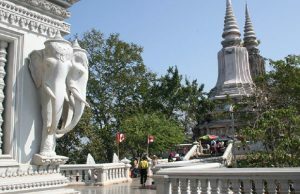 The name Samre refers to an ethnic group of mountain people, who inhabited the regions at the base of Phnom Kulen and were probably related to the Khmers. 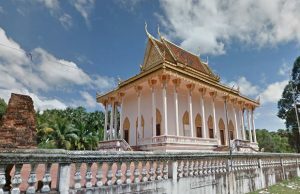 No inscription has been found for this temple, but the style of most of the architecture is of the classic art of the middle period similar to Angkor Wat. The monument most likely dates from the same period, or, perhaps, slightly later, although there are additions attributed to the Bayon style. The proportions of Banteay Samre are plended. A unique feature is an interior moat with laterite paving, which when filled with water must have given an ethereal atmosphere to the temple. All of the buildings around the moat are on a raised base with horizontal mouldings, decorated in some areas with figures framed by lotus buds.